.. what is the meaning of few or no retail stores with sales over $1 million in a neighborhood or ZIP code? Residential tranquility might be accompanied by limited shopping conveniences. What about adjacent ZIP codes? Absence of larger retail stores suggests lower economic activity. 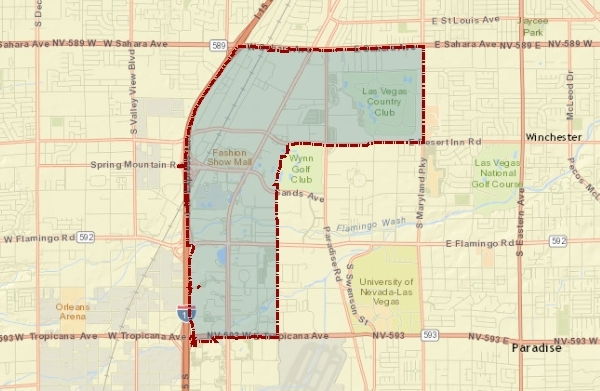 ZIP code 89109 in Las Vegas has 478 retail establishments with sales over $1 million — the largest among all ZIP codes. There are more than 4,700 ZIP codes with no (and more than 10,200 with 1 or none) retail establishments with sales over $1 million. See the interactive table below to examine each/all ZIP codes. Use data and tools reviewed in this section to analyze retail sales patterns by ZIP code. See more detail in related Web section. 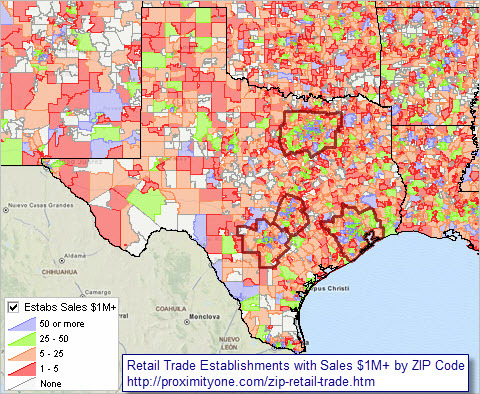 The following map graphic shows patterns of retail trade establishments in Texas and adjacent states with more than $1 million in annual sales by ZIP code. Four Texas metros (Austin, Dallas, Houston, San Antonio) are highlighted with bold boundary. Click graphic for national scope, larger view. Expand browser window for best quality view. As of 2012, there were 30,177 ZIP codes with more than 1.06 million retail trade business establishments. Of these, almost 500,000 establishments had more than $1 million in annual sales. Find out which ZIP codes and the characteristics of businesses in those ZIP codes using tools reviewed here. These are the most recent establishment sales data by ZIP code. They are not available from other national scope sources. These data supplement the annual ZIP code business patterns data that provide data on the number of establishments, employment and payroll by type of business (NAICS codes) — but provide no data on sales. 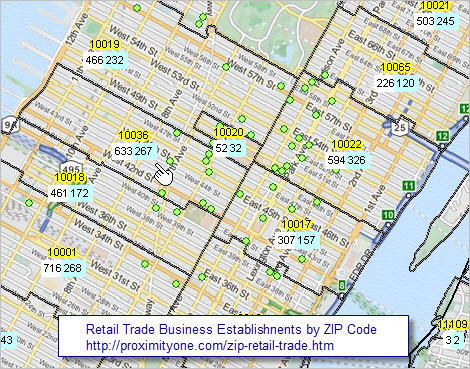 This section provides interactive access to the retail trade establishments by sales group for all ZIP codes. This section illustrates how these data can be used in GIS applications to examines patterns and associate these with other data. ZIP code and multi-ZIP code area profiles are also shown in this section. Examine market characteristics using profiles from ProximityOne for any combination of ZIP oode areas. ProximityOne uses the sales data to develop custom estimates of retail trade characteristics by additional categories linked with data from other sources. The following graphic shows ZIP codes (ZIP code shown by yellow label) in the New York city area. The total number of retail establishments (white label) and the number of retail establishments with annual sales in excess of $1 million (blue label). These ZIP codes are used in profile reviewed below. The interactive table below can be used to show that ZIP code 10036 is among the ZIP codes having the largest number of retail establishments in the U.S.
Use the interactive table in this related section to view, query, rank, compare characteristics of retail trade establishments by ZIP code. The following graphic illustrates use of the interactive table. All ZIP codes are ranked in descending order based on total retail trade establishments. Click graphic for larger view. 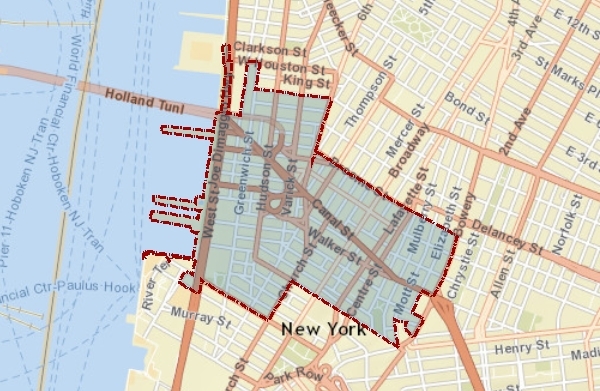 ZIP code 10013 in New York city has the largest number of retail establishments. Use the interactive table to examine ZIP codes and establishment patterns of interest.